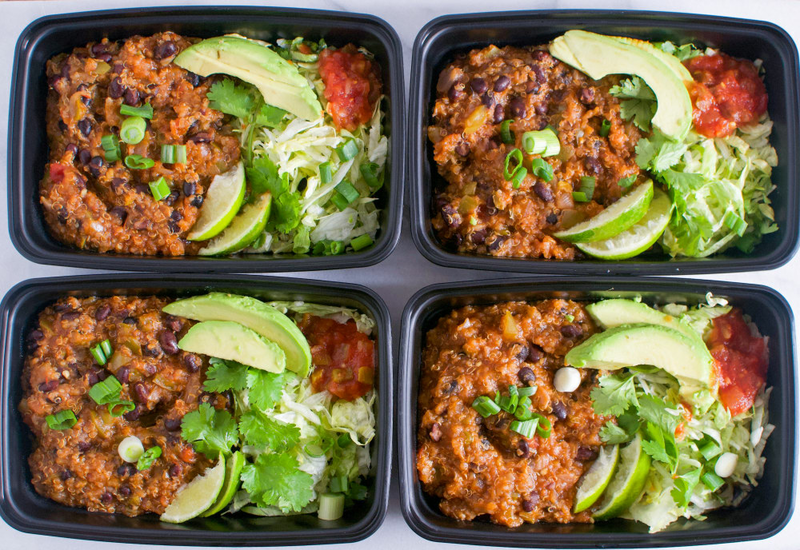 This meal prep idea delivers five vegan burrito bowls which you can customize by topping with your favorite burrito fixings. You will have delicious to-go lunches packed with Mexican-inspired flavors. The MultiPot Pressure Cooker is the solution for these meals in minutes. Peppers and onion are sauteed and seasoned with cumin and salt. Black beans, salsa and quinoa are added and quickly cooked in the pressure cooker. The result is a vegan and gluten-free meal that is sure to satisfy. Heat oil in pressure cooker set to Sauté. Cook and stir green bell pepper and red onion in hot oil until soft, 5 to 8 minutes; season with cumin and salt. Continue cooking vegetables until fragrant, about 1 minute more. Stir black beans, quinoa, salsa, and water with the vegetable mixture. Select Pressure Cook (Manual) and cook for 12 minutes on High pressure. Once the cooking cycle has completed, allow pressure to release naturally. Fluff quinoa with a fork and divide into five sealable meal containers; refrigerate for up to a week. Quinoa grows in a variety of colors, but the red, black and white quinoa are found most commonly in supermarkets. While the taste and nutritional value of each color is about the same, white quinoa tends to cook up fluffier. Rinsing quinoa removes it's natural coating, called saponin, which can make it taste bitter or soapy. This is a naturally occurring chemical which coats every tiny grain of quinoa to ward off insects. Per Serving: 134 calories; 2g fat; 23.7g carbohydrates; 6g protein; 0mg cholesterol; 730mg sodium. I have to admit that I didn't make this with quinoa. So there's that. I used this cool grains mixture featuring Japanese barley (in a green bag, but don't have the name anymore), which is delicious. I just don't really like quinoa's texture. Used a very spicy salsa with this and it was terrific. I liked it as a reheated lunch as described in the recipe. Not sure I would be quite as fond of it for dinner, to be honest. It's a great lunch, though. Definitely try this! I really liked this meal prep! My wife convinced me to try quinoa and it was much better than I expected. I love how light it is. Lots of good flavor too. This quinoa burrito bowl meal prep was amazing! The black bean, salsa, and quinoa mixture was so flavorful thanks to the bell peppers and onions. I always love using my pressure cooker and this just gives me one more reason. This quinoa burrito bowl meal prep was so good! I am now totally obsessed with quinoa. It cooks so perfectly in the pressure cooker, and I've also made it without a pressure cooker. So easy and delicious. I’ve always skipped the rinsing step, not knowing that was a must. Now I know why I always got that soapy flavor. This time I followed the steps and it was amazing. This is a great meal prep recipe, especially when you add some of your favorite toppings. You don’t need the apostrophe on it’s in your description. It is a possessive pronoun, not a contraction.